In herbal medicine we use the large fan-shaped leaves and flowers of Lady’s Mantle, a low-growing, long-lived herb that produces small yellow-green flowers. Lady’s Mantle grows best at high altitudes and the whole dried herb is used as medicine. 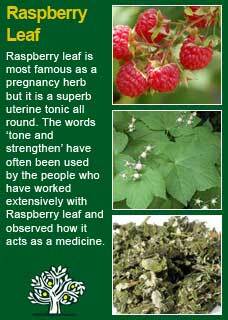 Lady’s Mantle is highly regarded as a herb to help women with excess menstrual bleeding. Given how dangerous and even potentially life-threatening this problem would have been in earlier times its name and reputation speaks volumes about how well it was relied on and how effective it was considered to be. Lady’s Mantle has also been traditionally used for colitis with bleeding and for diarrhoea. Lady’s Mantle is a herb that has been used to treat excessive bleeding from any cause and for unwanted or excessive discharges in general but it’s very specific indications are officially for ‘excessive menstruation and for non-menstrual bleeding of the womb. 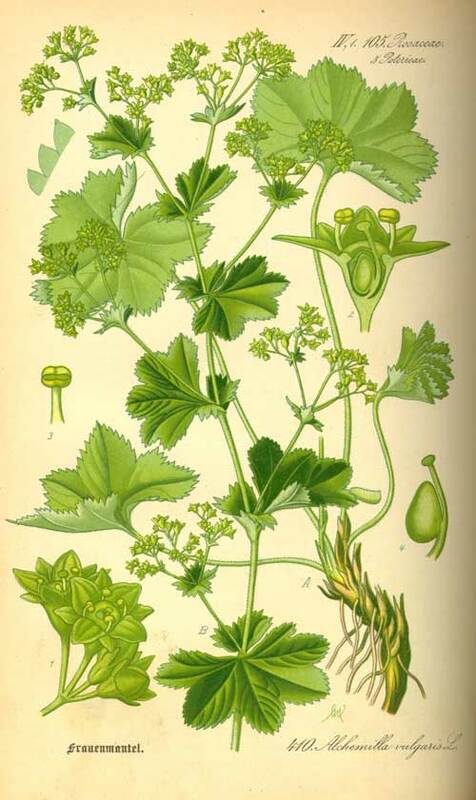 M. Grieve writes; 'Lady's Mantle has a considerable reputation as a herbal remedy, belonging to the genus Alchemilla or the great order Rosaceae. 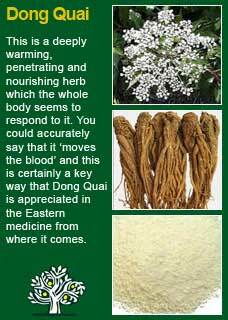 In modern times it is employed as a cure for excessive menstruation and is taken internally as an infusion as required'. 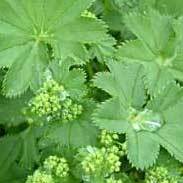 Culpeper says of it 'Lady's Mantle is very proper for inflamed wounds and to stay bleeding, vomitings, fluxes of all sorts, bruises by falls and ruptures. It is one of the most singular wound herbs and therefore prized and praised, used in all wounds inward and outward, to drink a decoction and wash the wounds thereof, or dip a cloth wet with the herb into the wound which wonderfully drieth up all humidity of the sores and abateth all inflammations thereof. It quickly healeth green wounds, not suffering any corruption to remain behind and cureth old sores, though fistulas and hollow'. Thomas Bartram writes that Lady's Mantle's actions are a 'powerful styptic & astringent because of its high tannin content, haemostatic, alterative, drying & binding, menstrual regulator. Bartram suggests it may be used for excessive menstruation, non-menstrual bleeding of the womb between periods, children's summer diarrhoea, colitis with bleeding, gastric & duodenal ulcers. The British Herbal Pharmacopoeia (BHP) describes Lady's Mantle's actions as astringent & antihaemorrhagic and says it is indicated for diarrhoea, dysentery, passive haemorrhage & menorrhagia & topically for leucorrhoea & pruritis vulvae and specifically indicated for acute diarrhoea & epidemic diarrhoea of infants. The BHP suggests a dose of 2-4 gms or by infusion and recommends 2-4 mls of the liquid extract up to 3 x daily. The name Alchemilla, comes from the Arabic 'alkemelych', alchemist, bestowed by olden writers because of the wonder-working powers of the plant. Many believed that alchemical virtues lay in the subtle influence the rich accordion foliage imparted to the dewdrops that lay within its leaves and these dewdrops were used in many magical potions. In Swedish traditional herbal medicine Lady's Mantle was given as a tincture in cases of spasmodic or convulsive disease and it was believed that if some of the herb was placed under the pillow at night that it would promote a good night's sleep. I did find some lists of constituents, but I did not find any articles of scientific research on Lady's Mantle through online searching or in any of my texts or reference books. This doesn't mean that there isn't a scientific basis for its historical and traditional use, there must be, it's just that no-one has looked into it! 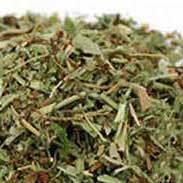 Lady’s Mantle is a very safe herb to take in high or frequent doses when needed. Most authors will say it is safe to use in pregnancy and that it may even help with preventing miscarriage if the cause is a uterus that is not sufficiently holding its tone. The reason that Lady’s Mantle has been so highly rated to help with excess bleeding is that it has very strong levels of what are called ‘astringent’ properties. These are generally attributed to tannins being present in a herb and are familiar to anyone who has made a cup of ordinary black tea too strong. Those puckering kinds of ‘drying’ affects you get in your mouth from too-strong tea are the tannins at work. However, all of that is not quite as simple as it might sound. You would be as far off the truth in thinking that all tannin containing herbs are basically the same as if you said that all sweet tasting cakes were the same. Sugar is certainly just sugar but there are an endless variety of ways in which sweetness can be conveyed, likewise astringency is something with great variability that works much better in some forms than others. 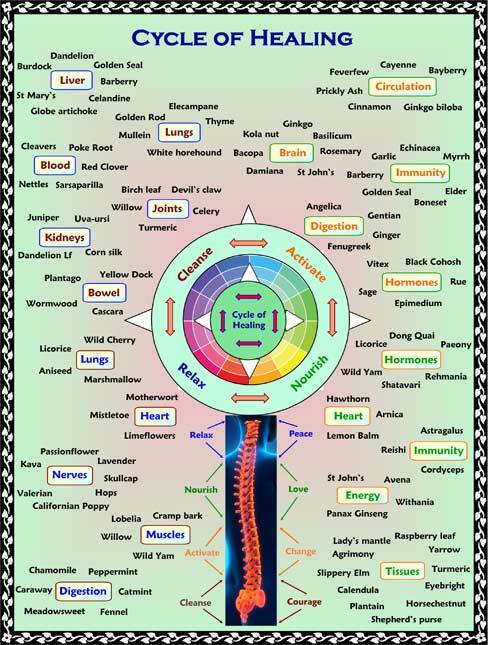 If you who are reading this are studying herbal medicine or just have your own reasons to wanting to know this plant ally at a much deeper level then I urge you to take a good dose of Lady's Mantle and then, with a quiet and attentive mind, observe for yourself the 'action' of the herb and how it makes you feel. 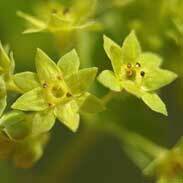 The binding, toning, strengthening nature of Lady's Mantle just lasts and lasts. It never reaches an uproar of activity, it just keeps persistently sending its quality deeper into the body until it gets to where it has to go. I think that if you try this ancient method of experiential learning that you will gain an appreciation of it that no amount of abstract knowledge could convey. 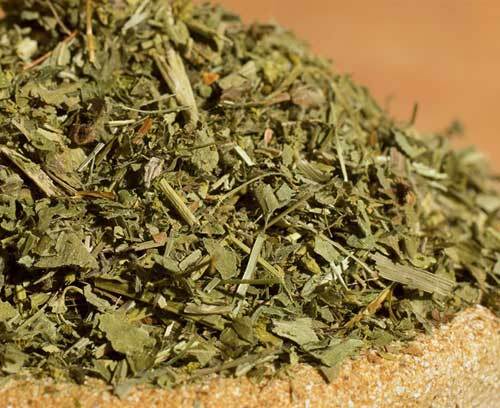 This is a deeply healing herb, used with care and understanding it can be of great service in a time of need. 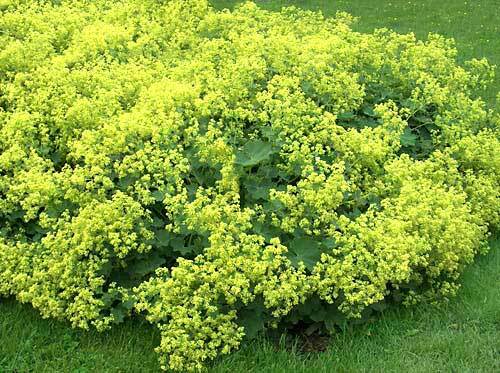 The best way to use Lady’s Mantle is with an open mind as to how much and how often will be required. 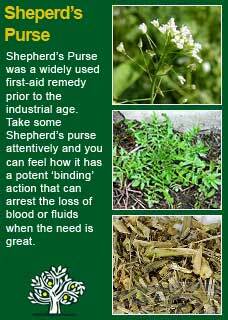 I will often combine it with other tonic herbs like Shepherd’s purse or Raspberry leaf so there is a fair amount of cross-over between the ways I use those herbs as well here. It is not necessary the size of the dose of Lady’s Mantle that determines how quickly it helps but it can often be the frequency. I tend to start my own patients off at a fairly small dosage level and then recommend they use the herb frequently and in slowly increasing amounts until it works. The thing about excess bleeding is that it really doesn’t take long to work out if you are getting better or not. The hardest part of any of this is always the first time. I would suggest a starting point and a good average for what works would be about 2 or 3 mls of the tincture taken every hour or every couple of hours. This is mostly how I have successfully used it in practice but it can also be used as an infusion whereby you can make an effective dose by using approximately 2 grams, which you will get if you heap up 1 tsp as much as you can, in 1 cup of boiling water, covered and steeped for a good 10-15 minutes and then strained and drunk. If this was not clearly making a difference then you could double this dose to 2 very heaped tsps (approx 4 grams) if desperate, but note that it will make a rather strong tasting cup of tea! The 1 heaped tsp dose should be adequate to get the action of Lady's mantle, and again you can make and take the tea every few hours until the bleeding has stopped or at least slowed right back to a safe and reasonable level. Ideally you should let the astringency of either the tea or the tincture be well felt in the mouth for a few moments, especially when you are first getting used to it. I think that you will tolerate the intensity of it okay if you remember that this binding action you are feeling is working in your body in the same way as it is in your mouth, and somehow being more 'conscious' about its action in this way helps it to work better. As well as being one of the best remedies for excessive bleeding, Lady's mantle is a true uterine tonic and I have used a great deal of it for problems such as endometriosis, fibroids, infertility, and disturbed or painful periods. I understand that it conveys a tonic, strengthening action to the tissues, helping wherever there has been a loss of tone or function. For such uses the dosage needs to be quite different to a 'take it as needed and in increasing doses or frequency until the bleeding has eased or stopped' but rather as a small accumulative tonic amount, best taken twice a day for as long as needed. In such cases as little as 2 mls of the Lady's mantle tincture in a formula of other herbs should be ample to see its benefits and it can safely be taken for several months if this is how long is needed to get a full appreciation of how much it is able to help. Lady’s Mantle extract combines perfectly with herbs such as Raspberry leaf or Dong Quai as a uterine tonic for some kind of weakness of the tissues and with Shepherd's purse for excess bleeding. Much of the information here about the traditional uses of Lady's Mantle is consistent with the model of thinking whereby one may treat problem A with plant B. There is value in this approach, especially in how it helps us pass on useful knowledge to one another, but it falls short in one vital area; and that is that people are not all cut from the same cloth! Something that works brilliantly for one person may do little for another -why is this?